I have setup a granite slab to bake some baggies up to 12" long. Following Alfonso's setup, this one seems to work quite well. My oven has no bottom heating element, so I have to flip the baggies to color their bottoms. No big deal, and some initial poolish baggies yield seen below. 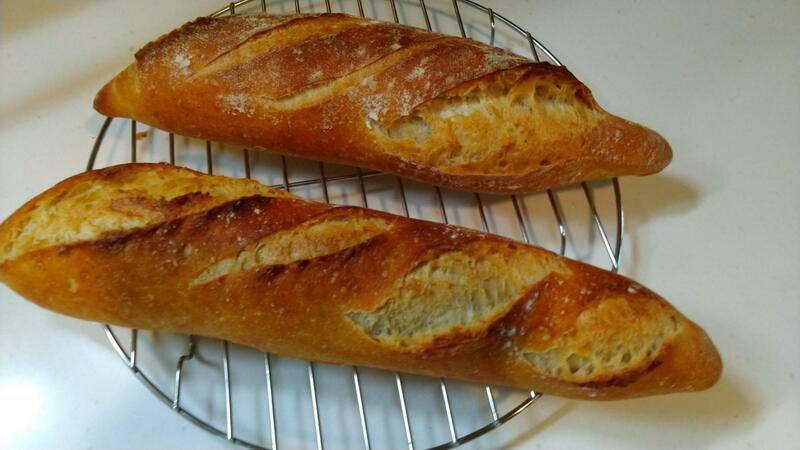 Yep, they look more like batards, but tasted great. Do you preheat the slab? Do you preheat the slab or just preheat the oven (the slab would take a while to catch up, if you see what I mean)? Thanks Clazar123, I do not heat the slab and I have been just preheating the oven with the slab inside for about 25 min Yes, it might not be enough to heat all that mass, but I don't want to waste energy either. I would like to keep it around 25 min preheating time. Second things first! I can't lay claim to the "cut to size" granite baking deck. I believe that I saw Lazy Loafer's write-up on it. First things first. They look great. Really nice shaping and scoring for a beginner at baguettes. So, if I've inspired you to tackle the baguettes in any way, I'll gladly lay claim to that. A while back I was just a wee bit disappointed to learn that the esteemed M. Calvel referred to what I bake as long batards, and not baguettes. Limitations on my oven size restricted the length of them to the depth of my oven. Kendalm, who has monstrously good looking baguettes here on TFL, has solved his problem by slipping them into his oven sideways thereby having the advantage of the oven width to dictate his baguette length. Apparently it is the shape, length, weight and number of scores that signified, at least according to M. Calvel, what the bread designation is. No worries Mate, call it what you like, as I do mine, although I'll still refer to them as both in the same sentence. if you are sufficiently satisfied with the basics, the shaping and baking parts, then I suggest having a go at viewing a few videos on scoring by Ciril Hitz and by the King Arthur champs - Jeffery Hamelman and Martin Philip. And also the TFL tutorial by our own dmsnyder's updated tutorial on scoring. Thanks Alfonso for the notice on Lazy Loafer's customized granite slab. I bet there are many others out there using the same idea, which works quite nicely. It has been always good to see your baguettes, so they definitely worked as inspiration. You and Kendalm have mastered the techniques, which is a nice available reference. I am pretty OK with the first results and sure I wold like to try better shaping and score techniques. The length and depth of my oven are not much, so I will still have mini baguettes. then get stone mason to cit the stone in half height wise or get on half as thick. That baby will need an hour of preheat at 5000 F.
I like to teach baguette scoring with a piece of paper. You should be able to bake 16" long baggies in that stone. So draw a baguette shape about 3" wide and 16" long.now draw two dotted lines length wise down the baguette with each one being 1" from the long side, Now the baguette is divided into thirds lengthwise. All 4 scores scores start on one line and go to the other but not outside of either. This forces you to score more longitudinally, correctly, instead of across the bread widthwise. Make suret o overlap the scores one to the next by 30%, Draw those 4 lines they will be about 6" long each . If you use a pencil you can get them just perfect. Now turn the paper baguette so it i perpendicular to your body and lay your razor or lame down flat at the start of the first score. Now rotate the blade a bare 30 degrees off of the flat. This is the perfect bald angle you want to maintain. No practice making the scores sure and quick over your template ones without cutting it 1.2.3.4. Get used to the angle of the blade, Visualize the center third of the top of the dough so you stay in it only with each cut. Next time you do it you will organize yourself, visualize the center 3rd, get that 30 degree blade right and make your (4) 6" long, overlapping each 30%, scores firm and sure. Even you will be amazed how easy it will be and easier each time from then on. I believe that you are referring to the diagram below. It is a good guideline.